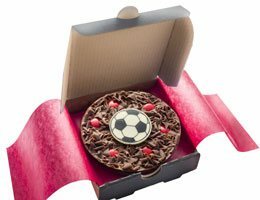 Our Football Pizzas make the ideal chocolate gift for any football fan. Available in four different sizes -either as the 4 inch mini, a 7 inch, 10 inch and large 12 inch chocolate pizza base they can be customised with different coloured rainbow drops to match team colours. 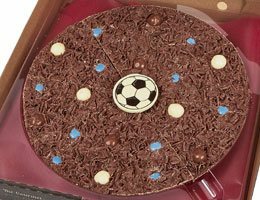 Perfect for sharing during a big match, an alternative to birthday cake for avid football fans or as a standalone chocolate gift, our Football-themed chocolate pizzas will add that extra special touch for football fans of all ages. We know football fans are a passionate bunch so what better way to express their love for a team than with a football pizza customised in their favourite team colours. Featuring a solid Belgian milk chocolate base, milk chocolate curls, our football pizzas are decorated with a central white chocolate football plaque and chocolate rainbow drops in whatever colour combo you need (please note the only colour we can't do is black!). Simpy select your size, tell us your team colours and let us do the rest!